The main kit (SS89) contains the following components Point rodding kit. 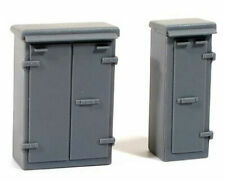 REMINDER: plastic kit, may require building and painting. Two boxes of differnet types are contained in this kit. Assembly and painting required. Expo 73545 No.234 Razor Saw Blade (fits X-acto). 80 thou (.080") 2.0mm thick clear plastic card. PICK UP OPTION. 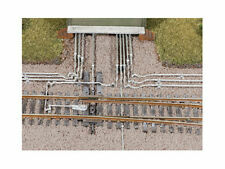 Wills SS87 Concrete Trunking (OO scale plastic kit) Includes straight and ‘T’ sections. Expo 73545 No.234 Razor Saw Blade (fits X-acto). 80 thou (.080") 2.0mm thick clear plastic card. PICK UP OPTION. Two boxes of differnet types are contained in this kit. Expo 73545 No.234 Razor Saw Blade (fits X-acto). 80 thou (.080") 2.0mm thick clear plastic card. PICK UP OPTION. Deluxe Materials AD25 Scatter-Grip Tacky Glue. Although moulded in grey plastic, which represents the galvanised steel of the prototype, the modeller can add a little weathering to help it blend into the scene. Assembly and optional painting required. OO GAUGE PECO WILLS MODERN. STONE COUNTRY STATION. WANTED: SECOND-HAND COLLECTIONS. TOP PRICES PAID. 1 ITEM: £2.00. OO GAUGE PECO WILLS MODERN. MODERN LEVEL CROSSING. WANTED: SECOND-HAND COLLECTIONS. TOP PRICES PAID. 1 ITEM: £2.00.